Here is the general career list for Kill Team Characters. Possibly a former member of the Officio Assassinorium, but also freelance killers. Career Ability: Chosen Weapon:An assassin chooses one weapon. This weapon gain +10% to hit +2 to damage and +2 to initiative. Gear: Choose either melee or sniper. Melee: Armored body glove, mono-edged sword, hell pistol. Sometimes they are Ex-Arbites looking to continue their trade. More often they are simply hunters of men. Career Ability: Grim determination: Bounty Hunters can choose to automatically succeed at an Interrogation or Inquiry roll once per session. Rebels against a totalitarian regime or depraved cultists? The kill teams aren't picky about who stops bullets. Career Ability: Crazed Will: Cultists can re-roll a failed sanity or willpower test. Gear: Carapace Armor, Choose any 3: Chain sword, Bolt gun, Bolt Pistol, Hvy Flamer, Chain Axe, Hellgun, Hell Pistol. Service to the Inquisition is brutal and many fall by the wayside. Some are cut from the fold purposely. The kill teams put them to good use. Career Ability: I know too much:Adepts gain the Forbidden Knowledge skill. Psyker: The adept may also choose to spend 50 of their starting points to be a psyker. they being the game with the psyniscience skill, one disciple skill, and twp powers. Gear: Piecemeal Armor(H:6 C:6 A/L:4) Choose any 3: Mono-sword, Bolt Pistol, Flamer, Hellgun, Hell Pistol, Hand Cannon. Weapon Style: Gunslinger (All Pistols), Two Weapon. Career Ability: Deadeye Shot:Gunslingers may re-roll a missed pistol shot. Once per session a gunslinger can choose to go first. Gear: 4 AP clothing. Choose 2 of the following: 2 Dueling Las, 2 Bolt Pistols, 2 hell pistols, 2 hand cannons. One pair of pistols can be swapped for an inferno pistol or plasma pistol. The outlaws of Dark Mechanicus have many reasons to join a kill team. Maybe they just got fed up with all the chanting. Skills: Willpower, Deceit, First Aid, Language(High Gothic), Lore(Forbidden Tech),Lore(Xenos Tech), Medicae, Security, Tech-Use, 1 Trade Skill. Career Ability: Scrapcode: A heretic can infect a servitor or cybernetic creation with scrapcode and take control of it. The scrap code also gives the Heretek a +10 when breaking into a secure system. Gear: Light Carapace Armor, Mechanicus implants, 2 cybernetic implants, Hellgun, Power Axe or Mono Great Axe. Ex-Gaurdsman and professional killers make up the bulk of kill team squads. Skills: Athletics, Brawn, Dodge, Endurance, First Aid, Language(Low Gothic), Lore(War),Perception. Sergeant: Command, Intimidation, Add Power to the Merc weapon style. Heavy: Add Heavy and Launcher to the Merc weapon style. Specialist: Add Plasma and Melta to the Merc weapon style. Career Ability: First Rank Fire! Second Rank Fire! : Mercenaries can fire their trusty lasguns twice a round with no penalty. Gear: Carapace Armor, Hellpistol Choose one: Hellgun, Long Las, Hvy Bolter, Plasma Gun, Melta Gun, Power Sword, flamer, bolter. 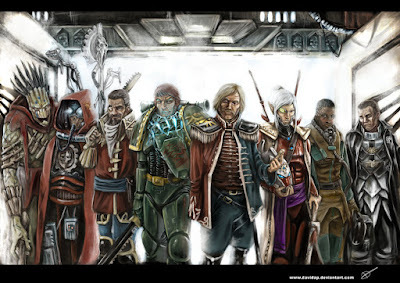 Pretty much what you call the crew of any kill team ship in the first place. Skills: Charm, Dodge, Language(Voidborn), Language(Low Gothic), Lore(Voidships), Lore(Void), Navigate(Stellar), Pilot(Air), Pilot(Voidship), Gunnery, Tech-Use, Choose any 1 other skill. Career Ability: Shipmaster: Pirates can re-roll any failed Pilot(Voidship), Navigate(Stellar), or Gunnery tests. Gear: 5 AP void suit, power blade, bolt pistol, shotgun. It is not unheard of for a navigator to leave their house willingly. More often though these navigators are survivors of the infighting between the navigator houses. Skills: Dodge, Language(Voidborn), Language(Low Gothic), Lore(Warp), Lore(Void), Navigate(Warp), Command, Tech-Use, Choose any 1 other skill. Career Ability: Warp Eye: Gain two navigator powers. Each power is it's own skill. Rogue Navigators are always considered to be from a Renegade house. The underhives provide a ripe breeding ground for just the right kind of people for a kill team. Career Ability: Cheap Shot: Recidivist double their chance to crit when attacking from surprise. Gear: gang leathers (ap 4),mono-knife. Choose 2: hand cannon, hellpistol, bolt pistol, shotgun, bolt gun, bolter, hellgun, chainsword. Anything is better than the black ships. Career Ability: Psyker: Begin the game with Psyniscince, two psi-disciplines, and two powers per discipline. Gear: flak coat,psy focus, Choose 2: hellpistol, hand cannon, mono-sword, neural whip, auto gun. With access to a ship and money, a warrant less scion often founds a kill team rather than join one. Career Ability: Natural Leader: The rogue trader can grant a +10% bonus tp the crew skill when commanding them. A group with a rogue trader also receives bonus ship points. Gear: Enforcer carapace, plasma pistol, bolt pistol, power sword. Choose 5 skills, 1 lore, and 1 language. Choose 1 and add it to your base weapon style: Bolt, Chain, Shock, Flame. Select a career skill from one of the other careers or work with the GM to create your own.